I'm an illustrator, artist and designer. I do fashion illustration as well as editorial work. I make my own products and I'm really into making zines. I would say that my love of vintage and retro inspiration is a very marked characteristic. In my personal life, I draw inspiration from my love of the past - in how I like to dress, in the music that I listen to, in basically everything aesthetic that I like. I've been into drawing since I was a little kid. I think that fashion was important to me growing up; I was more interested in clothes than in drawing. In college I studied illustration, but I wasn’t trying to be an illustrator. I wanted to be a fashion editor and drawing was really more of a hobby. Eventually something clicked and illustration became a major passion of mine. I realized that I could combine the two things that I am passionate about. I like making images, I'm not sure why. As an artist, there is just something inside of you that you want to see outside of you on paper or canvas. I've always been interested in visuals. I love that with illustration you can create a whole world on paper. As opposed to photography where you work with what's already in the world, I can have a vision and completely translate it on paper from my imagination. I don't know why I work on paper specifically. I think that it's because I don't think of my work as fine art. It’s more about the image than it is about the physical object. Each painting is a vision into a different world, my idealized world. I think it was really just an organic thing. It's just based on things that I like and sometimes I don't even know why I like them, but it's just what I'm into. I put it all into my work and try to make things that are aesthetically pleasing to me personally. In terms of the girls that I draw, there are certain things that I've noticed I like. They are all kind of beautiful in the end, which is what I go for. But I like quirks like pimples and big ears and a big nose and crooked teeth. That's an important element of my work and of the world I have created; it makes it more interesting. Perfect is boring. 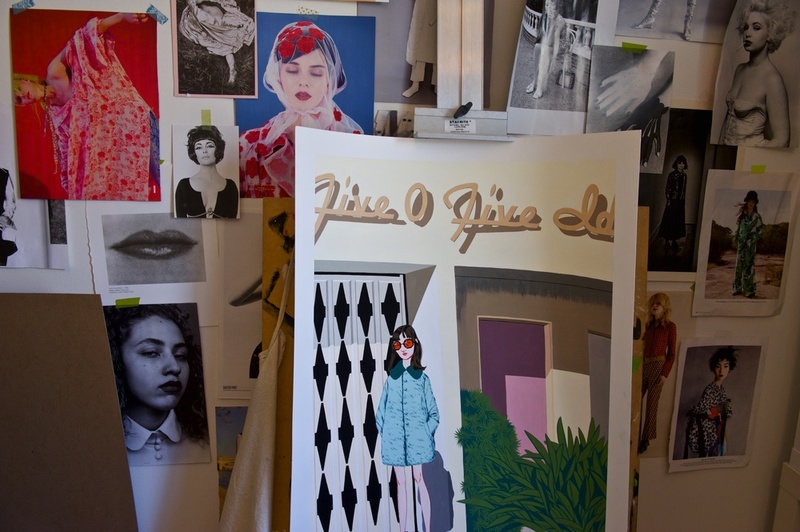 Are your illustrations informed by fashion or current trends? Definitely. I consider my work fashion illustration. Fashion is one of my passions. As I mentioned, I used to want to be a fashion editor, but I like that I am involved now through illustration and it's filtered through my own lens. I take direct inspiration from runways. I'll take a runway image and create a whole story of who the girl is and where she would be. I then place her in that situation within my illustration. That's where a lot of my pieces start. But my work is not about trends at all - that doesn't interest me. If anything I like clothes that are more retro. So it's just my little studio with a little table. It has a nice window for light by my desk. I have my big computer to work on and a scanner. I love my studio. I do wish I had more natural light and I would love to have a bigger studio one day, but for now it works well for me. My work is so small that I don’t need much space. I always work best when I don't have a lot of other things to do. When I’m not so distracted I find that I can really get into it. But really, I can kind of paint and draw anytime; I like doing it in the middle of the night, I like waking up first thing in the morning and painting, I like doing it in the afternoon. I'm not an artist who likes to paint out of my head. In all of my pieces, even if I created a new image, which I always try to do, every element is a reference. I take pictures around town of houses and signs and plants that I can use for reference in my work. That's a big source of imagery for me, which is why my look kind of reflects LA and the vintage parts of the city. So I'll take a runway look and then put it in front of a house that I saw with a plant that I saw. It's basically a collage, but with paint. For my sketches, I make a lot of digital collages. So I'll take the photos, cut them out and photoshop them together to create a sketch out of all of the images and then work from that because it's faster than traditional sketching. But sometimes if I have a good clear image in my head, I’ll just create a sketch right on the piece. With acrylic gouache I can completely cover the sketch. I don't have to worry about erasing. Acrylic gouache is also nice in that you can paint as many layers as you need and it won't lift up. That works for me because I can change whatever I want as I’m going. Often, even though I’ll do a sketch, I still don't know exactly what the piece is going to look like when it's done. That's part of the fun of it - working on it and not knowing exactly where it's going. But with client work I can't do that as much because I want it to look like the sketch, but that can be fun too. And then there are my zines, which are more experimental. I consider making zines a fun thing that is a profitable and cool way to get my work out there, but is also a break from intense painting. There is a really different mood between when I want to sit down and get a piece done and when I want to make a zine. For example, in my zines I’ve been experimenting with risograph a lot lately. It's kind of like screen printing in that you have to work in layers. I’ll work with black ink on layers of tracing paper, scan it in, and then compose the images digitally, which will then be printed. It's actually a really satisfying process for me. I like working on the computer. Black and white ink work is another respite for me. When I don't want to be painting or when I am just working in my sketchbook, I will just paint in black ink. So really my process is different based upon my mood or how much time I have. Does social media play a role in your process? It has been a huge thing for me. I’ve been putting my work online since I started college, which ultimately was a good thing because I would get jobs from people seeing my work online - and I still do. It’s so important. Instagram directly helps with my work. People reach out to me through Instagram and it translates into direct product sales. It’s also good for making connections and meeting other artists and people who are into my work. It’s fun. The fashion world is so fast moving that social media has to be a part of it, because it’s always turning over. With fashion in particular it's actually kind of stressful how much is coming out, especially because I’ve always been into using runway looks for my work. I'll save all of these images of things that I want to draw from the runways, and if I don't get around to it there will be new stuff coming out and then it’s not relevant anymore. I’m really not someone who likes technology that much. I hate it in some ways; I don’t like sharing things about myself. But I am okay with sharing my work because I am proud of it and I do want people to see it. 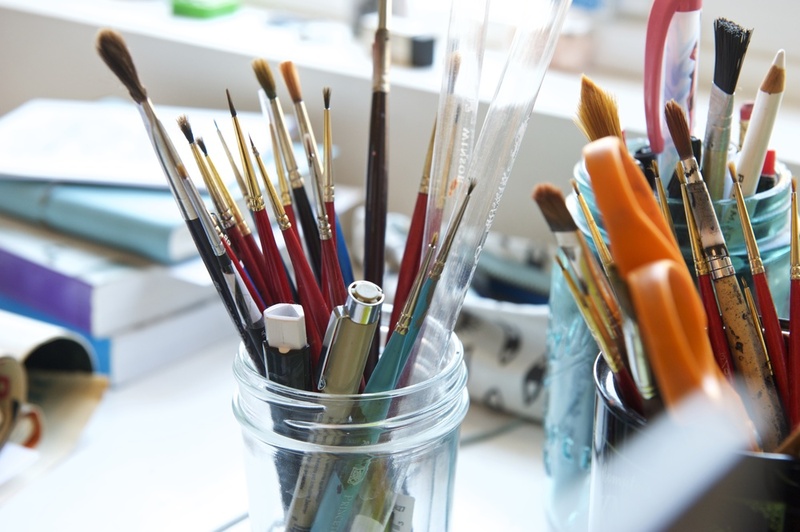 Are there any practices in your life that inform your artistic practice? Just being around Los Angeles is really important to me. Every time I go on a walk I see something new that is inspiring to me. Even driving around LA I always having my eyes open looking for inspiration, which I feel like is everywhere if you just look. The same is true of when I travel. I am always taking pictures to use in my work. The same goes for going to museums and art shows as much as I can, which I think is important for getting new ideas. Even if it is work that doesn’t directly relate to mine, it's nice to see what everyone else is doing and to get new ideas. I feel like almost everything I do in my life inspires me. I am always reading and looking at new books. Even just going to the store and looking at vintage clothes gives me inspiration for things I can paint. I take in any culture that I can and I feel like it filters into my work somehow. I am so inconsistent in how I work - it can be anything depending upon my mood. It is nice to just wake up in the morning, put on some music or a podcast and turn off my phone. To paint and to not check any emails or anything is a nice ritual, but it is rare that I get to do that. I also like to light a candle or incense, it makes it nice. The most difficult part is challenging myself to try new things. For example, for a long time I wouldn't even draw backgrounds, but now I am obsessed with doing really elaborate backgrounds though that was once a big fear of mine. I also wouldn't draw or paint men for a while. It was really uncomfortable for me and I felt like I couldn't do it. Now I push myself to do it for client work. Getting out of my comfort zone, I say to myself that this is something that I never thought I could draw or paint and have not wanted to, but I am just going to try it and see how I can make it. That is a hard thing but it's satisfying when I do it. Challenging is fun to me. I find the most ease when I am painting. Luckily I am not an artist who struggles when they work. If I have an idea I know I can execute it. The actually painting of a piece is the most satisfying part - it is so relaxing and fun. How have you learned what you know? Did you have any teachers or mentors who helped shape you as an artist? There were good teachers in college that helped me. I went to Art Center in Pasadena and it was a really good school. They taught us how to be professional, which was the main thing I took away from it. There was one class in particular in which we learned how to draw with black micron pens, which I had never done before. It is a specific style of rendering that I don't use in my pieces anymore but that still translates into my work in certain ways. It was something that opened up my world once I was taught how to do it, and it has stuck with me ever since. But otherwise it has been a learning process on my own. I feel like my style really came from my own personal interest in art and exploring. 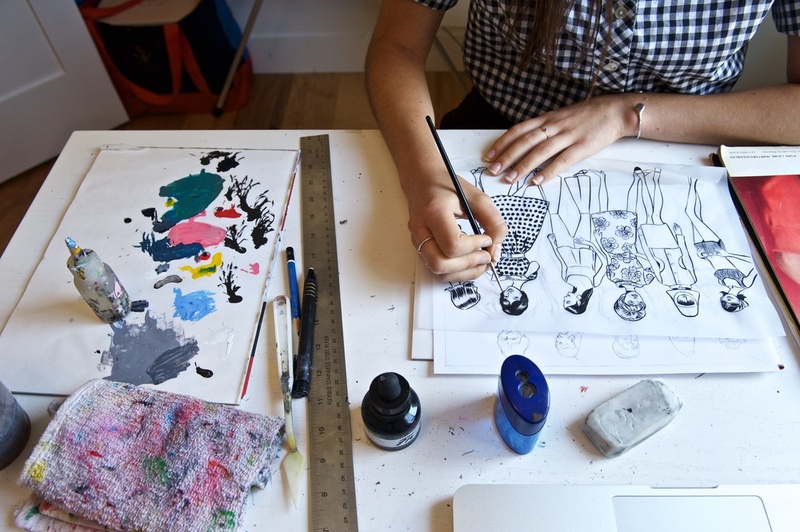 In what ways do commissions and commodification play a role in your work? I think that commissions feed my work. I love doing commission work for other people because it usually brings something to me that I never would have thought to do or poses a new challenge. An illustrator collaborates with other people and takes ideas and translates. So when I work for a client it’s all about translating an idea. Often, to satisfy the criteria of a commissioned work, I’ll have to use a new style or bring something different into the piece, which then eventually filters back into my own work. So it all feeds itself. It's always a learning process. In terms of commodification, I’m really into that actually. I want my work to be on more products. Having my own range of products with my drawings on them is a long term goal of mine. So I like seeing my art commodified. I work part time at a print design studio where we design prints for clothing. My name is not on the work; I don’t own any of it. It's all for the company. That doesn’t bother me either, it satisfies what they need and is still fulfilling for me. I like that my work can be on random things; I enjoy seeing my work out in the world. I sometimes see girls around town wearing my bags and it makes me so happy. I hope to make things that people can treasure, and that bring them joy. If anything, I think that my mom taught me by example to have my own point of view and to not care what anyone else thinks. Not that I view myself as so alternative or anything, in my art or in my life necessarily, but I feel like I have always known what I like. I have always been determined to stay on my own path. I think it's important to know what you want in life - to be an individual. What has illustration taught you? It has taught me confidence in my own tastes. Once I saw that people were interested in my own unique perspective, I realized that I had to trust that I have something in me that other people want to wear or buy. I never get manicures anymore because I always get paint all over my hands. I get paint all over myself - it’s on everything. Bijou Karman in Los Angeles, California on July 31, 2016. Photographs by Julia Girardoni.